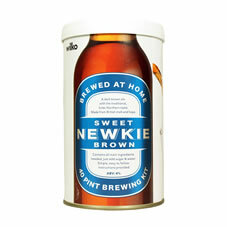 My latest home brewing experiment has involved 2 kits that were going out of date. I’m not sure the impact of out of date beer kits, I imagine they would last a lot longer than the date stamped on the bottom of the can like most food stuffs. My idea was to combine both kits in the fermenting bucket, add 1kg of sugar and about 20 litres of water. I did this last weekend and the fermenting has been working well with the airlock making plenty of noise from the gases being made. I’ve never combined 2 kits before, usually its too expensive to do, but I got these kits cheap from Wilko’s in the sale last year so thought it would be an ideal opportunity and if it turns out like something I made in my bath tub I’ve not lost much. I hope to bottle the beer next weekend and should get an idea of how it will taste and will report back. Brewing season is back! I have a few beer kits I picked up cheap during a Wilkinson’s sales and thought I would try an experiment with some caramel syrup bought from Costa Coffee. The beer kit was bought for £5 so if its a disaster of a brew its not been a huge was of money! I mixed the Stout, sugar and Caramel with 2 litres of boiling as described by the instructions and filled the fermentation buck up with cold water to the 23 litre mark. I’m leaving the brew in the fermentation bucket for about 2 weeks with the brewbelt keeping it warm and hopefully at 21°C. I might add some more Le Sirop de Monin Caramel when the froth has stopped being produced. I’ll post the results in a couple of weeks when I bottle the beer. A few weeks ago I brewed a Coopers Ginger beer in hope that it would be ready for summer. During the brewing process I think I forgot to wash out the steriliser from the fermentation bucket, I was daydreaming as I’ve done this process so many times now! So I let the ginger beer sit in the living room for a few weeks and it has been fermenting. Judging by the bottom of the fermentation bucket it looks like the yeast has been busy. It was time to start the secondary fermentation. To save a few hours of sterilising bottles and equipment I transferred the ginger beer in to a keg, not something I like to do as it becomes far too easy to access the beer! I keep my beer in the shed which keeps it out of sign, out of mind! I did some research online and I found that if you don’t wash out the steriliser with cold water it may kill the yeast. It seems to depend on which steriliser you use though. I was using Richies steriliser bought from Wilkinsons. So far my batch of ginger beer looks ok, I may have even washed out it and it will be fine, who knows. If anyone has had a similar experience with forgetting to wash off the steriliser from buckets and equipment please post a comment. I was in a big Tescos store at the weekend and was surprised to see the same range of home brewing stuff as you find on their online shop. The range is mainly Cooper’s but there were other brands such as Youngs. This is worth remembering if you’re after some home brew kits or accessories and can’t get to your local home brew shop. Its much better to support the independent shop that the giant that is Tescos. I use Tescos online shop and get it delivered free to my local Tescos, which is quite small, to pick up. This is ok if I can’t get to Birmingham and my local home brew shop, but you need to remember to order early as it takes a few days for them to deliver the brewing stuff to your local Tescos. The Blushing Blonde home brew I did at the start of the summer has been ready for a few weeks now but I haven’t got around to posting on the blog. The result is a nice refreshing beer and a recipe I would do again. As you can see from the picture there isn’t much head in the beer but it’s still quite fizzy. It tastes really good and you can taste the berries, it gives the Canadian beer kit a kick. I have heard some people call this kit a bit bland. There are bits floating in the beer which I assume have come from the berries but you can’t taste them and they don’t make you ill! I might have left the beer and berries in the bucket too long before bottling. I would so this again but I think I made a mistake using mixed frozen berries, I think next time I would stick to one type of berry to give it a more distinctive taste. I probably would change the kit too, maybe do it again with a Coopers Mexican kit or a Pilsner kit. What I do like, but unrelated to the beer, is the Coopers PET bottles I used with this brew. They’re smaller than the normal glass bottles but a good size for a drink in the evening. This weekend I started a Coopers IPA beer kit with the recommended ingredients 500g CoopersLight Dry Malt and 300g of brewing sugar. The beer has been in the bucket less than a day and it is bubbling away nicely which is a good sign. This home brew I’m going to use some Jack Daniels Wood chips in the secondary fermentation to give the beer a whisky aged feel. It could work out great or be a complete disaster but it’s going to be fun finding out. I’m aiming eventually to get something tasting like this St Peter’s beer, it may take a few goes though. I picked up some Wilkinson’s brewing sugar, it is useful the local Wilko’s stocking these home brew essentials now. This weekend it had been 2 weeks since starting the Simply Beer Brown Ale and Coopers Pilsner with honey home brews so it was time to transfer them from the fermentation bucket to the bottles. It was an easy process and I managed to fill just short of 80 bottles, I probably could have squeezed out another 8 bottles but I ran out of bottles. I filled each bottle with roughly 1 teaspoon of white sugar. I didn’t take any hydrometer readings, I know I should! I tasted both ales and was impressed with the Pilsner as you could really taste the honey which made it quite sweet. The Brown Ale was good too, a typical ale and reminded me of the Woodfordes kits I have done in the past. I took a picture of each ale to record what it looked like into the bottles. Now to keep the bottles warm for a week and then take them down to the shed and leave them for 3 weeks till the first tasting. Last weekend I got another home brew experiment on the go, this time I’m using a Coopers Pilsener kit from Coopers Heritage range of kits. I’ve never done this kit before, I tend to stay away from larger style kits as I prefer ale. To add something different to the beer I’ve opted to add a jar of honey into the mix. I decided to go for some upmarket honey rather than any value/own brand honey. I ended with a 325 gram jar of Australian Blossom honey from Waitrose. The sugar used was just a kilogram of silver spoon white sugar. All the ingredients were added into the fermentation bucket at the same time and mixed thoroughly. The bucket was filled up to 23 litres. There has been 1 week of fermentation with good weather which has meant there has been lots of activity and gas being produced coming through the airlock. The brew is very light coloured in the bucket so far. In the initial parts of the fermentation you could see the honey suspended in the bucked but this has now disappeared. I’ll bottle it next weekend. All 3 items came in in at just over £20, not too bad if it works and makes 40 pints, about 50p a pint. I added all the items into the clean fermentation bucket with 2 litres of hot water and mixed. I filled the fermentation bucket up to the 21 litre mark and added the yeast that came with the kit. Commercial yeast was recommended on the website but the yeast that comes with the kit is good enough for me. I’ll be bottling this kit 2 weeks, will post some results up then. I have done the Sparkling Ale kit before and followed the instructions on the can, the results weren’t great as it was very flat and not sparkling, it still got drunk though! With all my equipment clean, I added the Draught Beer Kit, Golden Syrup and Brew Enhancer 1 into the Fermenting bucket with 2 litre of hot water and mixed. I filled the bucket up with 21 litres of cold water and added the yeast that came with the kit, although commercial yeast was recommended. In 2 weeks I’ll be putting this brew in a keg, I’ll post up the results.